Keeping track of our protected species populations and their distribution is one of the tasks of biologists, and this summer Te Papa scientists surveyed sites in the Mercury Islands group for seabird populations. Flesh-footed shearwaters Puffinus carneipes breed throughout northern New Zealand, with a total population size in New Zealand of about 10,000 to 15,000 pairs of birds. One of their strong-holds is a small island in the eastern Coromandel, Ohinau Island. The species breeds during September to May. Details of the species biology can be accessed on www.nzbirdsonline.org.nz/species/flesh-footed-shearwater. 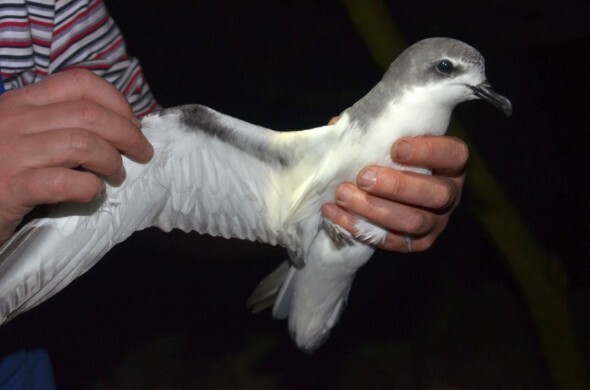 As in previous surveys (https://blog.tepapa.govt.nz/2012/02/02/te-papa-seabird-researchers-in-the-field/, https://blog.tepapa.govt.nz/2013/01/16/life-through-a-burrowscope-lens-subterranean-titi-island/), we assessed the number of breeding birds by carrying out transect surveys at the breeding colonies, estimating burrow density as well as the occupancy of species in the burrow with an instrument called a burrow-scope (see https://blog.tepapa.govt.nz/2012/02/02/te-papa-seabird-researchers-in-the-field/). Having completed several surveys over a five-year period, our data are able to analysed to estimate any changes in the population. 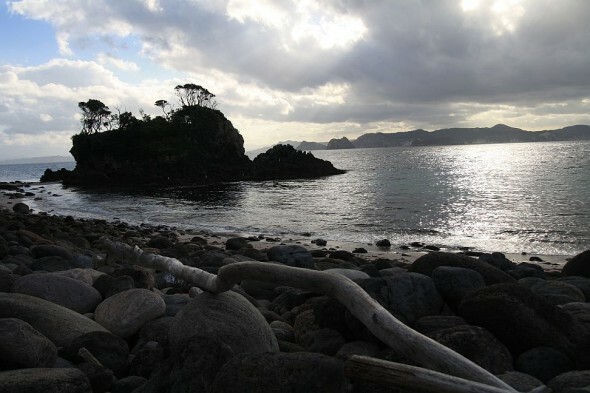 Ohinau Island is owned by Ngati Hei iwi, and efforts to restore the site of the last decades have lead to a recovery of vegetation, as well as securing the site for breeding seabirds. Rabbits Oryctolagus cuniculus, Pacific rats Rattus exulans and mice Mus musculus were eradicated in 2005, and Mercury Island Tusked Weta Motuweta isolata introduced in 2007. This very rare weta was only described in 1997, and is restricted to sites in the Coromandel/Hauraki area. These species may have been present at Ohinau Island historically, but they fell prey to rodent species there. 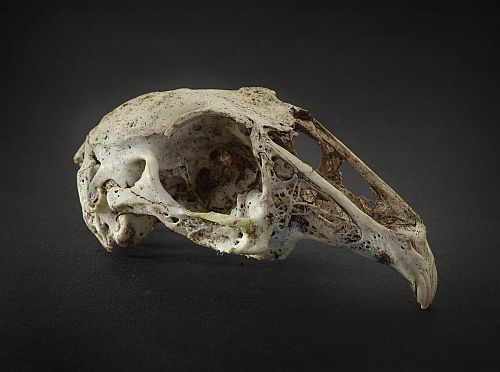 Skull of a rabbit found at Ohinau Island, one of the last remnants of the invasive species eradicated around 2005 from the island. Photo Michael Hall, Copyright Te Papa. Flesh-footed shearwaters are the main seabird species breeding on the site, although we also saw Pycroft’s petrel Pterodroma pycrofti, fluttering shearwaters Puffinus gavia and blue penguins Eudyptula minor. Diving petrels are also likely to occur. Pycroft’s petrel Pterodroma pycrofti at Ohinau Island which landed among our tents one evening. Photo Ingrid Hutzler, Copyright Ingrid Hutzler. To find out where the birds spend their time at sea, we attached GPS trackers to the birds by taping them on their back feathers, in collaboration with Dr John Arnould of Deakin University. The birds carry a 20g logger for approximately two weeks, and it tracks their movements at sea by taking a location from satellites every 15 minutes. Following their visit to sea, we recover the logger from the bird and download and start to analyse the data. From this, we can build a detailed picture of the areas at sea used by the birds during breeding, and assess their overlap with fisheries and work out whether they spend time in particualr areas used by commercial and recreational fishers. 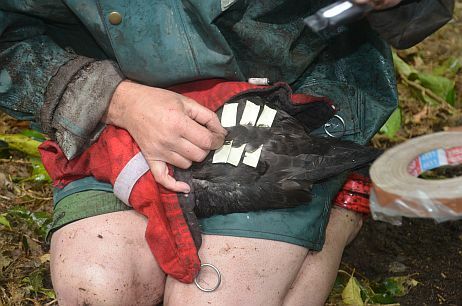 Deploying a GPS logger on a Flesh-footed shearwater, using waterproof adhesive tape on the back feathers. Photo Ingrid Hutzler, Copyright Ingrid Hutzler. 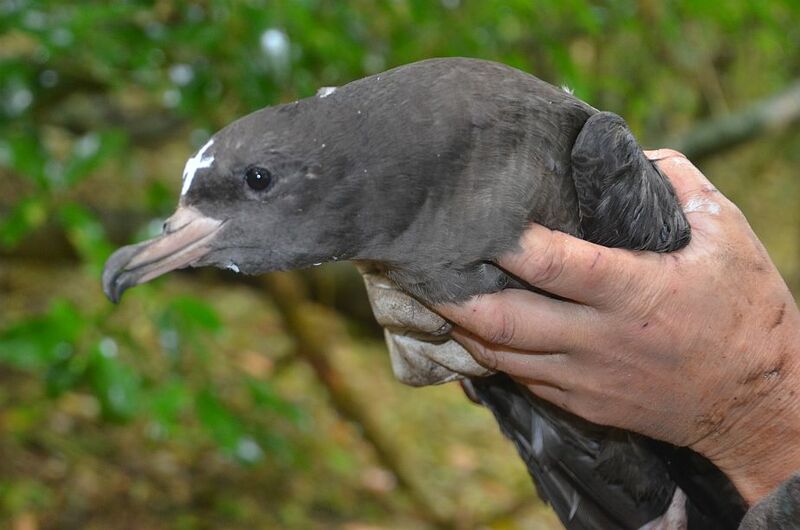 Flesh-footed shearwater equipped with GPS logger and marked with correcting fluid on the head. This makes it easy to identify in the burrowscope image whether the logger equipped bird is present in the burrow, and reduces the amount of disturbance the birds are subject to. Photo Ingrid Hutzler, Copyright Ingrid Hutzler. 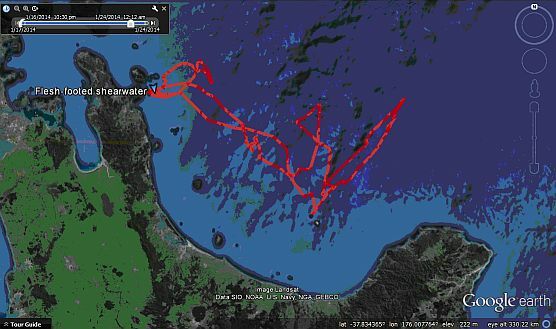 Flesh-footed shearwater GPS track from its breeding site at Ohinau Island, Coromandel followed during 5 days in January 2014. Image Susan Waugh, Copyright Te Papa. The Hauraki and Coromandel areas are heavily used by many fishers, both commercial and recreational. Fish-hooks commonly used by recreational fishers were found at the breeding site, suggesting the birds spend time interacting with these fisheries. Captures of this species is also recorded in commercial fisheries in northern New Zealand. 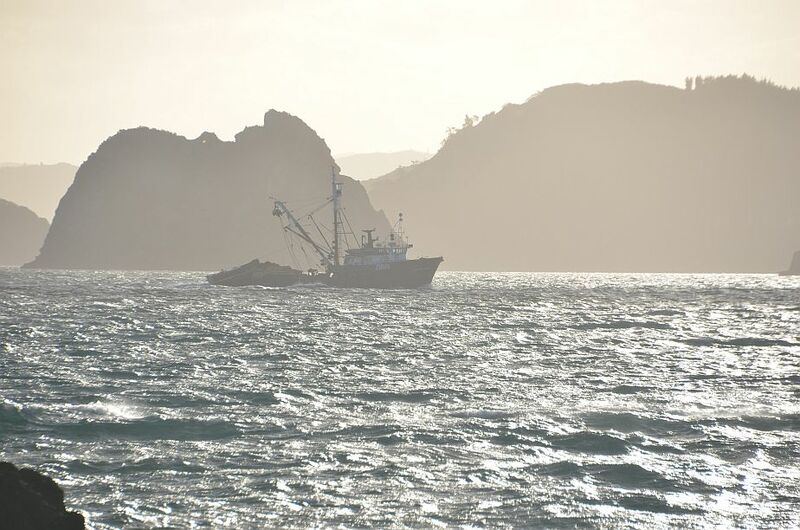 Fishing vessel heads out to sea in the evening in the Mercury Islands area, January 2014. 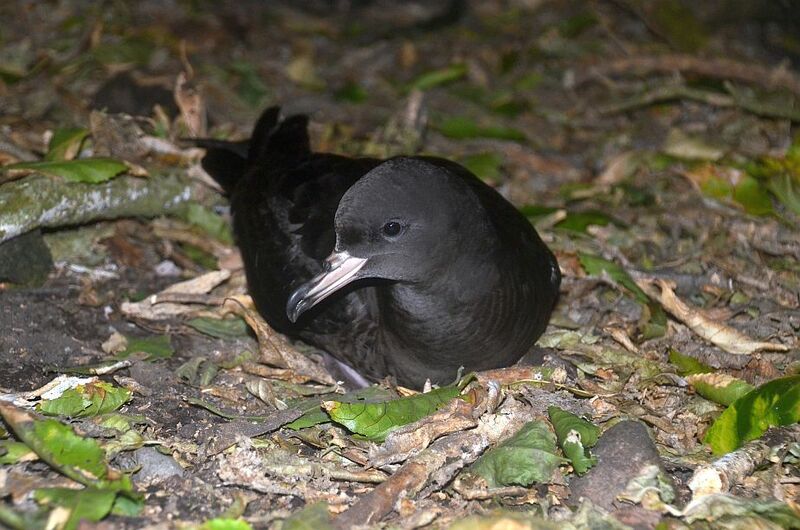 This work is part of a larger project looking at the impacts of fishing on vulnerable populations of seabirds nationally, and is funded by the Department of Conservation and Te Papa. A special thanks to Lizzy Crotty, Ingrid Hutzler, Robyn Blyth, Colin Miskelly and Liam Miskelly for their excellent help with the field programme.